I've always been pretty certain about my artwork. Any doubts I have I think are not as strong as those that many artists have. This doesn't necessarily mean I'm correct in my judgment. I may just be wrong or foolishly and blindly optimistic. Still most criticism doesn't bother me all that much. It may confuse me as I mentioned in a recent post when I get seemingly contradictory opinions from different people at the same time. And then there are of course snide comments that are easily ignored. I've found that snide comments are usually meant for the critics peers more than for the artists criticized. They always reek of groupthink. However when, many years ago, a woman blurted out in our painting class critique, that my paintings looked like Naugahyde it struck me. And she said it with passion. As though she was really offended that I would paint in such a way. I've always valued such passionate comments even if I disagree with them or don't really understand them. It's easy to tell that they are honest and an honest opinion is a rare thing in the world of art. What she meant I think was that my paintings, 6'x8' heavily painted abstract acrylic paintings at that time, had resistant, unyielding surfaces, the kind that made your eyes bounce back from rather than go into the painting. At the time I liked that. It seemed modern. I still admire many artists who work or worked in that manner. Stuart Davis, a great American painter in my mind, quickly comes to mind. I happened to think of this as I was working on this print. The first color on the Shina plywood looked somewhat transparent and watery in some versions. As I printed the ink got thicker and it turned into a more unyielding surface, like that which so offended my fellow student. One reason for using the plywood, outside of plain old curiosity, was that I thougth I might like its surface, especially in the background of a print. So I experimented with this and when I finally printed the first color of this print on good paper( Rives Heavyweight) I kept the ink thin. As I did this I remembered the old Naugahyde comment. So today when I went to color number two, this time on the first lino block, I also sought a thinner less reflective surface. I don't think I've ever worked this way in my linos. 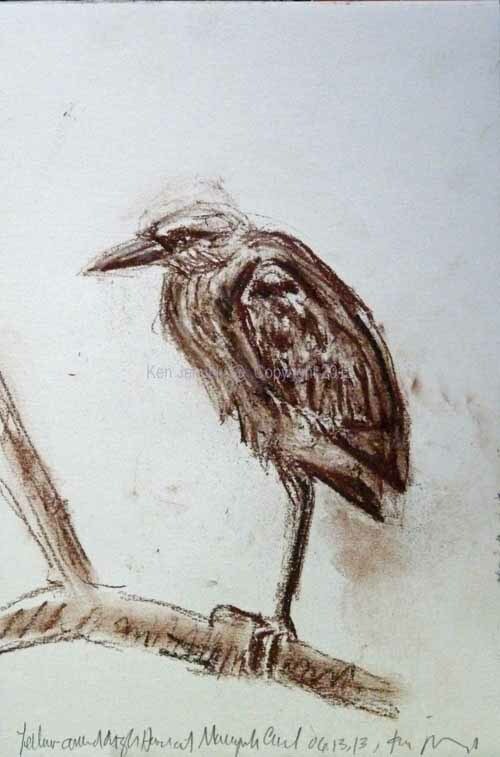 Certainly the Green Heron lino had very thick heavy ink. But this time I'm going to try to keep it thin and see what happens. This lino block will be reduction, which means that I'll remove some of the lino and then print different colors on the lino that remains. Finally I'll print black on the second lino, and hope that it all holds together and that I don't have to get out a fourth block to do some mending. At the moment I'm hopeful. And I finally understand that Naugahyde comment! The woodcut/linocut/reduction linocut went a bit awry yesterday so I took a break and organized my collection of dragonfly photos, including some new ones from the last few weeks. As I looked at them I remembered part of what I found so fascinating about drawing insects when I did so quite a few years ago. There is a complexity and elegance of structure that's just very desirable to put down on paper. Unlike birds or most animals there aren't any soft, furry, feathery areas that are indistinct and hide the structure. Insects have very visible structures. It's hard to understand the appeal of this but it may just be something natural to drawing. i.e. drawing is more often about lines than anything else and insects are full of them. Of course with dragonflies there is something extra. They often have the most striking patterns in wings, body or both. Here it's the velvet blacks and blazing white of the wings of this Widow Skimmer that stand out. I started paying attention to dragonflies and damselflies a year or two ago but it's only now that I can accurately (I think!) name more than ten of them. Naming twenty would be a great stretch. Above is a photo of the first Widow Skimmer I've ever seen. We saw it at Morris Arboretum over the past few weeks. It's a fairly common dragonfly I think and it's also a member of one of the most visible families, the Skimmers. So it's not rare. But it sure is a beauty. About a month ago I was contorted in a somewhat odd position to take a photo of an unknown butterfly along the Wissahickon. Two runners went by and said "Weird!" as they did so. I suppose it can seem odd to some, to stop and pay attention to the beauty and complexity of nature. But then I have to ask just what is it that others find so much more interesting than nature? I'm sure there are plenty of things. At one point in my life I might have also found them quite interesting, far more so than birds, butterflies and dragonflies. But today I'd just say '"Weird!". 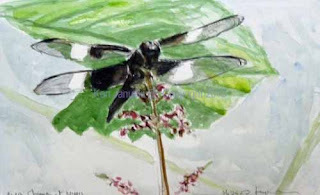 By the way I'm not really starting a Dragonfly a Day project. These types of projects seem popular online, at least from what I can see. 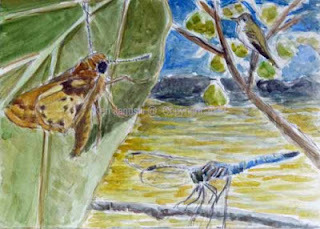 But it is something I could easily see someone more focused on dragonflies than myself taking up! They offer a lot to both viewers and artists. I'm currently reading Rebecca Salter's Japanese Popular Prints: From Votive Slips to Playing Cards. 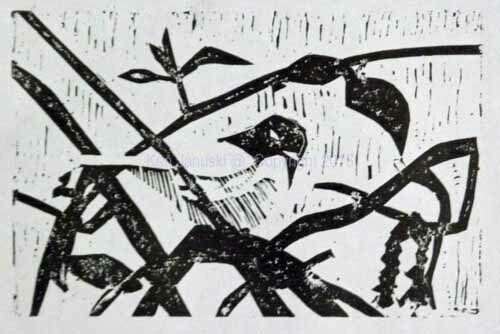 I've only just started it but one thing that jumped out at me was the statement that when these prints were most popular the carvers of prints were often more famous than the artists on whose work they were based. I'm sure I've heard this before but I hadn't yet tried printmaking myself. Now that I have I can begin to appreciate the importance of the carver. 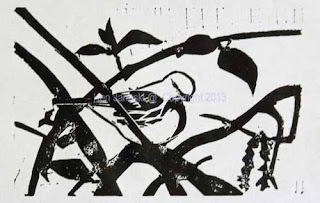 Obviously I'm doing nothing vaguely similar to what those great printmakers and carvers did. But the more I print the more I realize how complicated it is and how much subtlety can be achieved. And of course there is always something new that can go wrong. I think it's the realization, through experience, of all that can go wrong that is so striking. In any case I'm trying a few new things on this print. As anyone who has followed my two-three year lino career might guess I've changed styles to a certain degree, going from work that involves much more complex pattern, especially that achieved through hatching, to flatter planes of color. Actually I'm combining them both and only time will tell if that is a smart idea. Completely flat areas of color, almost like a silkscreen, are not really to my tastes though, so I think I'll always go for some sort of gradation, through hatching or otherwise, to break the flatness. I'm currently doing a lot of carving of line and then gouging out of unwanted areas rather than doing everything with a v gouge and leaving all sorts of patterns from the gouge but I suspect I'll always keep some of the latter. Above are two proofs of the background color done on the Shina plywood I mentioned in the last post. I've decided that this will be the background color and everthing else will go on top of it. The final color will probably be lighter, but this gives me some idea. Generally when I proof I do so on copier paper. But I had some leftover ink today and realized I could print on the back of some rejected prints on good paper. The advantage of this is that early on I get a more realistic idea of what the print will look like on good paper. Since I'm printing by hand, rather than through a press, the color is generally not as full and rich as it is on copier paper. This can be seen above. I'm still not sure which look I prefer, the rich flat look of the copier paper, or the more translucent look of the good printing paper. When I do color prints I normally do reduction prints, where everything is done on just one block. I have to proof on good paper as I go along because once I print a color I'll carve it away. There is no going back for later proofs of an earlier color. With this print I'm using one woodcut for the background, a linoleum block for most of the colors, and it will have some reduction, and another lino just in black for the final color. That's the plan anyway. I hope that it will allow me a little more flexibility and ease as I print. So this combination of woodcut, linocut and reduction linocut is another experiment here. And of course color and ink is always an area of exploration, intentional or otherwise. I still have a long way to go before I feel completely in control of the ink. As I said, so many things to think about! After I'd posted this I found that the hot weather drove me back to the lino -- too warm to do anything outside. 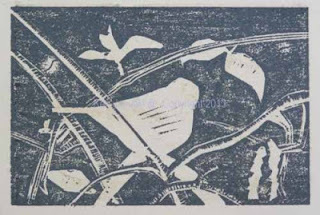 Since I have three blocks going at the same time here it was easy to pick up the reduction lino block and finish off the clearing out of the background and much of the bird. I've proofed it in water-based ink on copier paper above. Since I just wanted to test it I used black ink. But tomorrow or the next day I'll proof it in the yellows and olives of the Black-throated Green and perhaps some other greens/browns/grays. This is the most complicated block since it will use the reduction method. It will print on top of the Shina woodblock at top of page and in turn have tht black master lino block printed on top of it. Or so's the plan. I hate to think how long it's been since I last did a linocut. This seems particularly bad since Jerene bought me a new set of Japanese carving tools for Christmas last year. But things happen and I seem to wait for the spirit, or some such thing, to move me before I return to linocuts after a hiatus. This is the very first stage of the print. It's only 4x6 inches. And I'm trying something new here: cutting a master block as a guide for all of the others. So when this is finished it will just have the areas that I intend to leave black. 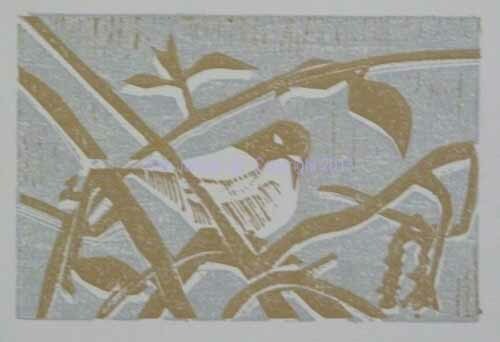 Then I'll take a wet print and rub it onto another lino and use it as a guide for additional colors. In fact I might do something more: add the background color on Shina plywood. One of my favorite printmaking suppliers, McClains, is having a sale. So I recently bought a number of pieces of this plywood to test it out. 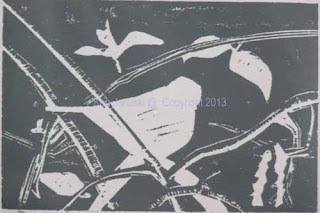 Part of the thrill of linocut to me is the improvisatory aspect. But it's also the most wearing and tense. So I'm trying this master block idea to see if I can still have some spontaneity in my prints without paying the price of weeks of worry! Right now I expect three or four other colors, but only time will tell. It's now breeding season for birds and has been for a month or more. Since we decided to volunteer for bluebird nest monitoring at Morris Arboretum this year we've gotten some first hand experience with breeding birds. At the same time we often seen breeding birds 'in the wild' so to speak as well. Recently we've seen Red-eyed Vireos, Eastern Kingbirds and Baltimore Orioles on nests. Earlier in the year we saw Blue-gray Gnatcatchers. Soon we'll see Orchard Orioles I'm sure, if we can just follow them to their nests. And of course one of the most common nesting birds we've seen is the American Robin. A loud thunk in our backyard this morning reminded me of how difficult the process to adult bird can be. Even though we have windows with closed blinds that shouldn't fool a bird into thinking open space and safety lies just through the glass this poor juvenile managed to hit our window anyway. Since it's on the second floor and away from most predators it's not easy to understand what happened. Jerene saw him from our bedroom window and yelled out to me. But when I got out a ladder to check on the roof on which he'd landed he wasn't there. Perhaps he'd survived? But then I looked in the gutter. Sad to say he was there and no longer alive. It's always sad to see dead birds like this. One thing that an artist can do is at least try to make a sketch or painting of them, both for knowledge's sake and as a sort of memorial. That's the case with this sketch and watercolor. 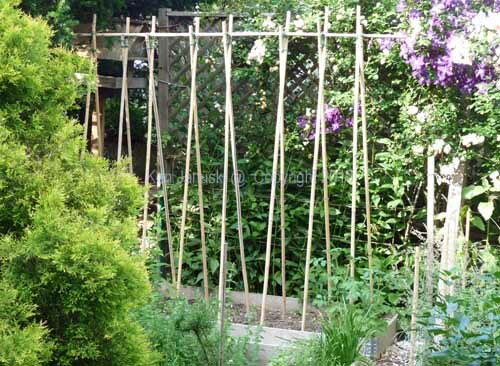 Brand New Bamboo Bean Trellis. I get a lot of email. Who doesn't? Much is from organizations we belong to. Like most people I glance at it and immediately get rid of 80-90%. 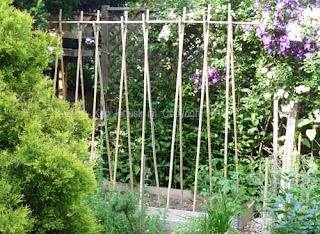 But when I got an email from Seed Savers Exchange and saw that there was an article on the best garden trellises I had to take a look. We have a very small yard though some would say it's relatively large by big city standards. Just about the first thing we did when we bought the house was put in eight 4'x8' raised beds. They've decayed and disintegrated many times over the years so last year I put in the newest version. Hopefully it will last a bit longer than some of the others. We do like to garden, for both food and for flowers and/or aesthetics. But we also like to feed the birds and create a habitat that will be welcoming to them. This creates a problem in a small space. There just isn't room for all that we try to do. 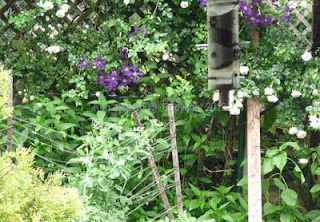 Still we do manage to make enough compromises to both garden and have a bird-friendly yard. Oregon Giant Snow Peas on Old Pea Trellis. A major structural part of our food gardening is trellises. We need to have a way to hold up the various things that grow to tall heights, in particular Fortex pole beans from Johnnys Seeds. 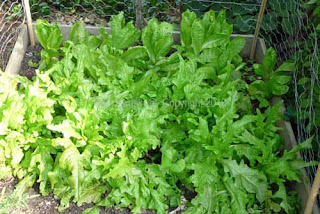 They are vigorous, delicious, rarely tough even at the greatest length, and last until late fall. The bamboo trellis at top was taken directly from the SSE blog. I think it will be much sturdier than the bamboo and twine trellis that I've used in the past. In the lower left of the photo above you can see the remaining Oregon Giant Snow Peas barely holding up to their cedar stake and twine trellis. Overabundant rain nearly brought them to the ground. But they've been delicious. Last night we celebrated Father's Day with a satay stir fry of these peas, chicken and soba noodles. Half of the Raised Beds. Last week when it was too wet to go into the garden I took the photo above from our bedroom window. 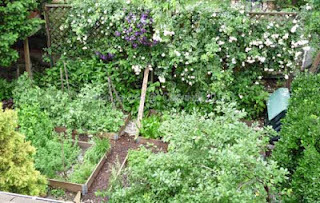 It's a nice view of four of the raised beds, two New Dawn roses and Jackmanii clematis on some very complex trellises I built for them a number of years ago, and an ancient plastic composter. At lower right a Winterberry, much loved by American Robins and others fights for space with the raised bed. 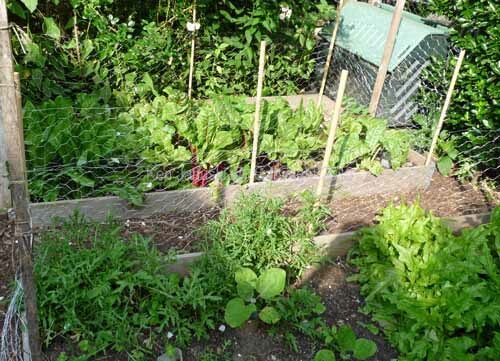 Greens Raised Bed and Lettuce and Eggplant Raised Bed. Yesterday my wife's outdoor cat, a very likeable cat but one that does damage both to local birds and to my raised beds, decided to put those giant litter boxes I'd built for him to use, killing a eggplant seedling as he did so. Out came the poultry netting that I'd ordered and just received thinking that such an event might be on the horizon. Hopefully it will also deter the squirrels that love to sample the eggplants and other vegetables the day before they're ready to pick. Above a view of our greens raised bed in background with Chard, Beet Greens and Dandelion Greens. In the foreground are the remaining eggplants (raised from seed so smaller than I'd like), some Arugula and heirloom lettuces. 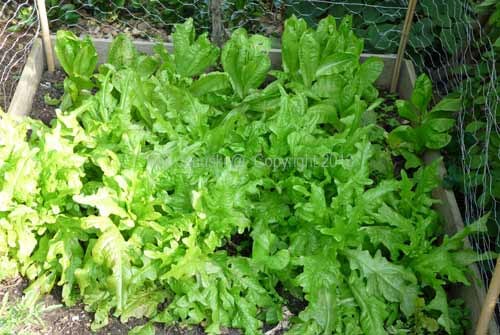 And finally a photo of some of those heirloom lettuces, Forellenschluss and Amish Deer Tongue among others. They'll probably bolt and go to seed all too soon. But for now they make the best lunches in the world. 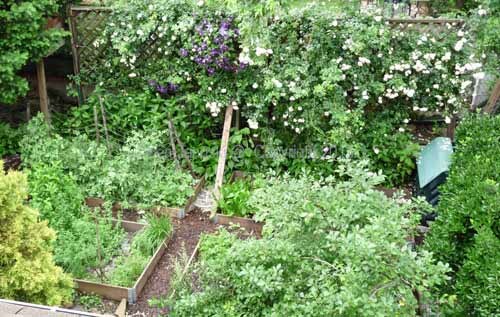 It's not often that I write about our garden. But it is a big part of our lives and the Seed Savers Exchange blog gave me an excuse to write about it. Now time to get back to art. Yellow-crowned Night Heron. Conte Drawing by Ken Januski. I realize that any complaints I make about my art, its acceptance in juried exhibitions, etc. as in the last post is always going to be subject to the possible charge of 'sour grapes' and/or 'artistic whining.' The odd thing is I have no sympathy with either, especially the latter. It is no doubt true that most artists of whatever sort cannot make a living from their art. That just seems patently true and not open to argument. I wish it were not so. And I suppose I could complain about that, especially when compared to the amount of money that goes to sports and some of the idiocy that is on television. But it seems fruitless. I wish our culture cared more for art but it doesn't. Silly to complain about it. The other side of this though and where I criticize the self-pitying artist is that I have no doubt that I'm doing what I love and that I'm exceedingly lucky to be able to do so! 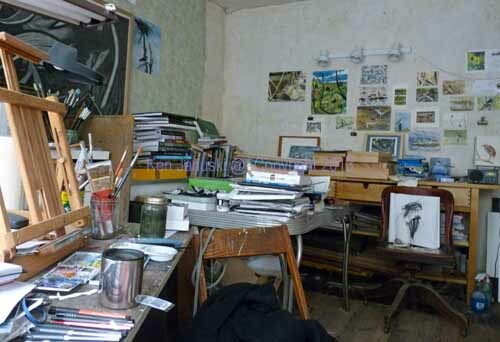 My Studio - June 2013. I thought of this a week or two ago as I looked about my studio, seen above. I think I might have been reading a book on birds or dragonflies at the time. I realized that I am now able to combine two of my great loves, art and nature, and spend most of each day on them. If I don't get distracted by other things this really is the perfect setup for me personally. It would be nice to get greater appreciation of course. But seen from the perspective of being able to spend most of each day being able to do what I love, it's very hard to complain. My love of art I think is older than my love of nature and the outdoors though I recall that even in grade school I couldn't stand having lunch in the classroom and would instead ride my bike over to the nearby woods and have it there. I also remember being scared out of my skin once or twice when I found snakes crawling near me. I don't think I've ever fully recovered to the one crawling through the spokes of my bike. In any case I think it's a lucky person who can spend most of their time with lifelong loves. It would of course be nice to see more income from this but outside of that I truly do think I'm a very lucky person. Yellow-bellied Sapsuckers. Conte Drawing by Ken Januski. I've continued to experiment with Conte crayon sketches. At top is an immature Yellow-crowned Night Heron seen at the Manayunk Canal in Philadelphia almost three summers ago. 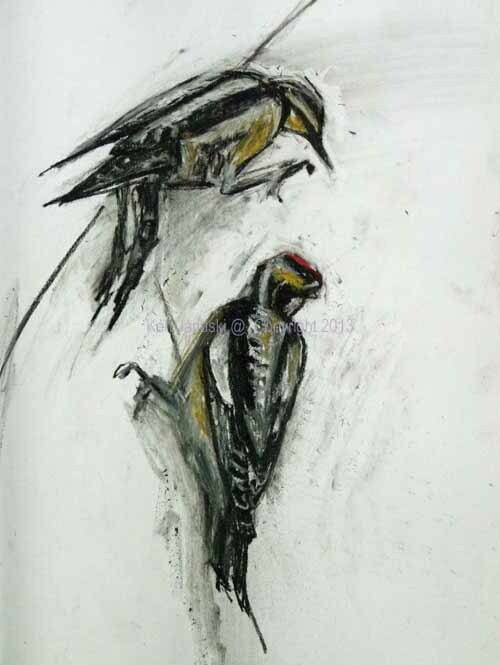 Above are a couple of studies of Yellow-bellied Sapsuckers. I particularly liked them because the photos showed some clue as to their structure, one that as in many woodpeckers is hard to decipher because of their complex feather patterns. In all of these sketches I've tried to accentuate the structure and not worry about superficial details. That to me is one of the appeals of Conte. If forces you to work somewhat broadly as Rembrandt did so successfully in his sketches. I haven't been showing much here recently mainly because I'm of two minds about it, or more likely three or forur or five. In other words I've got too much thinking and second-guessing going on. I first experienced this as a graduate student in studio art at the University of California at Berkeley. One advisor would come in, talk about my work, and often suggest certain changes. Within 24 hours another advisor would come in and do the same. Almost inevitably some of it was directly contradictory. The end result was that I had to think for myself, sift through all the information and decide what I wanted to do. This wasn't too difficult because I've rarely painted to please others. I paint what I want. Still when you get opinions on your work they always continue to rattle around in the back of your mind, like nagging little voices. This isn't necessarily bad. It probably helps to confirm me or anyone else in their own decisions. Years ago I think I startled some of my friends by saying that artists and CEOs were similar: they both had to listen to others but eventually make their own decisions, and live with the consequences. I'm not sure how many CEOs would agree, thinking I assume that what they do is far more significant. But for good, serious art I think the decision making is similar. In any case I've had a lot of thoughts rattling around in my head recently. This was compounded when I got two emails within a 10 day period regarding my work. One was from a well-known artists organization. It offered a critique of my work, very complimentary toward some of my linocuts, and fairly critical about others. All of this was done with the best of intentions and was overall quite complimentary. But the words hurried and pay more attention to anatomy still are in the forefront of my mind. On the other hand I also received a completely unsolicited email from someone who'd seen my work online and very much liked it, especially the warbler portrayals. She normally didn't like wildlife art but to her my work seemed an exception. 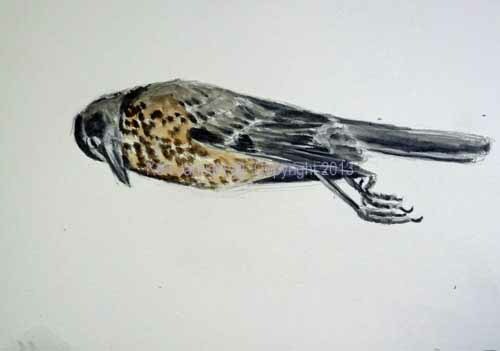 Since I entered the world of wildlife art with great foreboding, not liking much of it myself, this truly rang a bell. It was very appreciated. Unfortunately now I think of both of these every time I touch pen, pencil or brush to the surface. Should I worry about anatomy or not? When does anatomical accuracy, especially that of surface rather than underlying structure, hurt rather than help the artisitic quality of the work? Just as in graduate school both views are valid and valuable. I just have to decide what's true and what's important to me. Another factor in my indecisiveness, though to a lesser degree, was another rejection from Birds in Art. Yesterday I happened upon two blog posts alro regarding rejection in BIA: Sandra Blair and Susan Fox. I'm getting used to being rejected there. The one difference I think with me is that I expect it. And I also don't mind it all that much. Why? Well unfortunately I'm never really all that thrilled with what I see in the catalogs. I know that it's heresy to say this. And I'd prefer not to say it. I've been included in the last two Society of Wildlife Artists shows in London. I won't this year because I just can't afford all of the costs involved. So I won't apply. But if I'd been rejected there I think it would bother me much more. Some of the artists I most admire are members of the SWLA. It would bother me not to be in. But I'd also see it as something to strive for, a prod to get my work good enough to show with artists I admire so much. Sadly this is never the case when I look through a BIA catalog. I never feel the same desire to work harder. Instead I feel it's best not to apply, that I'm wasting my time and money. Only working in a style not true to myself will ever have a chance of success there. With all of this in the back of my mind I've done various studies recently, most for possible linocuts. And I've looked through my photos and sketches, over and over and over, looking for a new subject. None have led anywhere. Too many voices rattling around. How can I do the type of wildlife art I want to do? Should I continue to do what I want to do, or should I try to go more in the direction of what I think someone else wants? This always seems like a mistake to me to I continue to work towards doing what I want to do, towards what looks good and fresh to me. Then for whatever reason, possibly this recent post at The Best Artists, I got out Volume One of The Drawings of Rembrandt by Seymour Slive.What a breath of fresh air!! Though I admire all of Rembrandt's sketches it was the animals that struck me most this time. Who has done better sketches of lions? Who has captured the feeling of a lion like this? The same is true of people. If you look at a Rembrandt sketch you often see that just one line functions as a nose. A hand might almost seem to be a blob. BUT it reads as though it is a hand, with real weight, attached to a real moving body. Sometimes that hand will seem heavy as a five pound sack of flour. At other times it will seem as light as a feather, ready to waft off in the breeze. This is what Rembrandt captures with just a few lines. Out of curiosity I also got out the only other Rembrandt book I own, called The World of Rembrandt, from Time-Life books. Both of these are very old by the way. Though I've studied Art History at both Berkeley and Cornell Rembrandt always escaped my attention. I have no idea why especially as I bought both of these books long before I attended either school. I can only guess that I saw his drawings somewhere when I was very young and decided I needed to see more of them. In any case the Time-Life book also includes paintings and in them too you can see his incredible ability to capture the life of what he paints. He seems to have a physical empathy for everything he sees. I think what really hit me over the head in looking at his work was how different it was from work based on photos, particularly that of so much wildlife art. 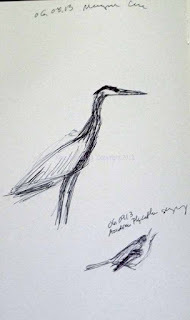 I did find one sketch of a Bird of Paradise, the only bird in the book as far as I could tell. It's not my favorite but still I like it. Today though most artists would render every feather. They wouldn't capture the entire bird. 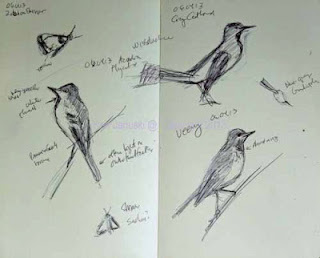 So much wildlife art crops out the full figure of a bird and instead focuses on the surface details of just one part of the bird. I prefer to see the whole bird, to see it as a living thing. I can of course only make the wildest guess as to what a contemporary Rembrandt would look like. But my guess is that it would show the same sense of liveliness and empathy for the subject portrayed, not in a cute, endearing way, but in a way that seems to actually feel the physical pose of each subject portrayed. To make a long story short, well more or less at this late stage of the game, I've tried a couple of broader works since looking at Rembrandt. 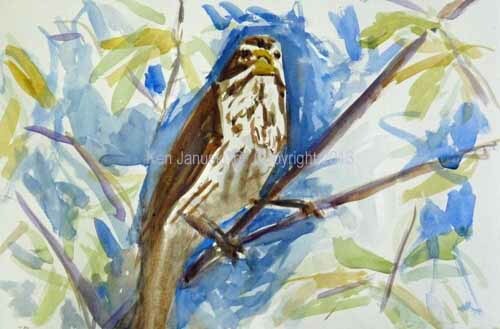 One is a female Rose-breasted Grosbeak, done from a photo of a bird seen at Magee Marsh about a month ago. I deliberately avoided using a pencil sketch and forced myself to work more broadly, more like Rembrandt. 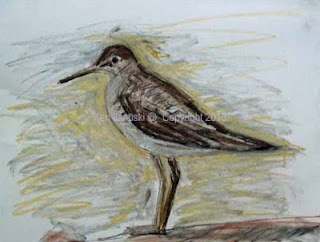 I also tried the large Conte drawing of a Solitary Sandpiper at top of post, also based on a photo of a bird seen at Morris Arboretum earlier this year. It was incredibly refreshing to force myself to avoid sketching in all the information that was shown in the photo. It has been non-stop rain here for the last few days so I've done little outside work outside of this sketch of a Great Blue Heron and singing Acadian Flycatcher, done in between storms. But when I next head out I think my Conte crayons will be with me, and Rembrandt rattling around in the back of my head. Try as I might I can't find any lingering migrant warblers. They seem to have moved on and now it's mainly the summer breeders that I see on our walks. That's fine. It really is as it should be. But each time spring migration ends it is shocking how quickly it has passed. It almost makes you want to give up sleep during the month of May. We have seen a few birds that I'm still not sure are migrants or breeders. The Willow Flycatcher at Morris Arboretum, which we see each year, is most likely a breeder but I'd like to prove it this year. The Yellow-billed Cuckoo that we saw at the Breeding Bird Census at Schuylkill Center for Environmental Education last Saturday is even more of a question. Could it be breeding there? The habitat seems suitable but I've never seen it other than in May or early June. I wanted to include it in the watercolor at top but it was hard enough to torture the Acadian Flycatcher into the composition. A bird perched even higher like the cuckoo just would never have worked. I didn't see all of the species seen here at the same time and location. 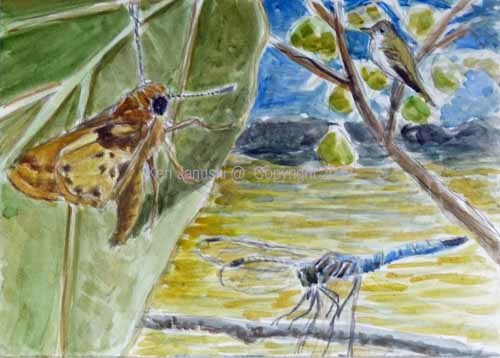 The Zabulon Skipper was seen in our yard and then also today along the Wissahickon. The Eastern Pondhawk, another first of year species like the skipper, was seen at Morris Arboretum on Sunday. And this Acadian is from a field sketch from today. As I think about it a Willow Flycatcher might have been a better choice since all three of these species would be likely at Morris. The other species seen today include a very perky Gray Catbird, another Zabulon Skipper, one of many Veeries, and a very small Blue-gray Gnatcatcher. In a sense they are homeboys and homegirls. This is their home for the next few months. The watercolor is done on Stillman and Birn 9x12 inch Delta paper. I've always liked all of the Stillman and Birn sketchbooks for working through compositional ideas. This is a somewhat outlandish composition. But I don't like dull ones for my own work. So I keep experimenting. To me that is part of the fun - to show familiar birds and other fauna in unexpected ways. 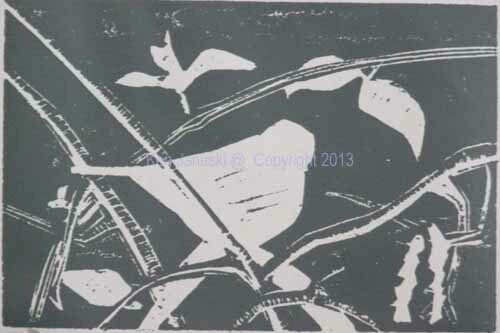 Eventually I hope to return to linocuts. This sketch is a possibility for one but my guess is that it is currently far too complex. But you never know. One day, soon I hope, one of these will seem just perfect for a lino.